I need the data to comply with a legal obligation, including UK tax law in relation to providing evidence of my business income, and my obligations under Etsy’s selling regulations. The data I receive on customers includes names, addresses and e-mail addresses, but I never receive payment or banking details. These data come to me mainly via Ravelry, Etsy and PayPal who have been authorized by customers to pass me the information necessary to fulfil an order. These organizations have their own privacy notices with which you should familiarize yourself. I also receive personal data directly from some customers who e-mail me to discuss or place an order. 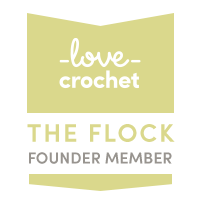 I don’t receive any personal data on customers buying on LoveCrochet or Makerist. I retain these data on customers in the form of e-mails from Etsy, Ravelry, PayPal or the individual concerned for the length of time required by the UK tax authorities (5 years after the 31 January submission deadline of the relevant tax year). The only circumstances in which I share your data will be in fulfilment of an order or in complying with the law, as given above in “What data I collect and hold”. I will never share your data with any other individual or organization. You also have the right to complain to the UK’s national privacy authority ico.gov.uk if you believe there is a problem with the way I handle your data. The recent changes in legislation do not alter things for me, other than I am publishing this privacy notice. I am glad the laws have been tightened up to prevent the abuse of people’s personal data by businesses and other organizations. So if you feel there is a problem with any of the above, it’s probably a genuine oversight on my part and I’d be glad to hear from you about it. If you have any questions at all, please get in touch at contact@littleconkers.co.uk.